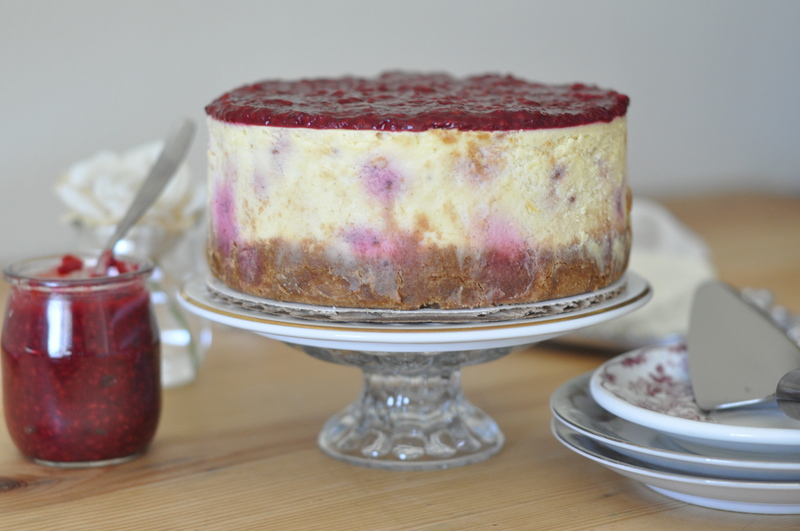 This year for Mother’s Day, I kept it simple and decided to go with a raspberry cheesecake for both Mom’s. Since it’s getting warmer out, I wanted something that was more transportable. Also, I was pressed for time and didn’t want to be rushed in decorating a cake, which was my other option. When I was looking for cheesecake ideas, I found a great article on the Kitchn about the difference between Neufchatel cheese and cream cheese. Basically, the main difference is in the fat content. Cream cheese has more milk fat than Neufchatel cheese. When picking up ingredients at Whole Foods, I coincidentally came across the two types of cheese. For experimental sake, I opted for Neufchatel cheese. Both came in 8-oz packages, with Neufchatel cheese costing a bit less. I used my usual cheesecake recipe and made an equal part switch with cream cheese for Neufchatel. The results? In terms of taste, there’s not much distinction between the two. 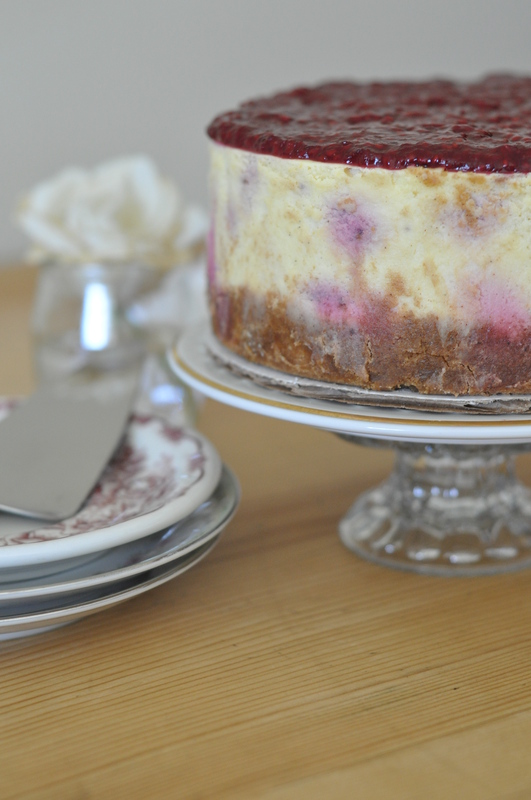 The cheesecakes came out dense, creamy and a bit tangy. So, I say, use whichever cheese you can get your hands on. 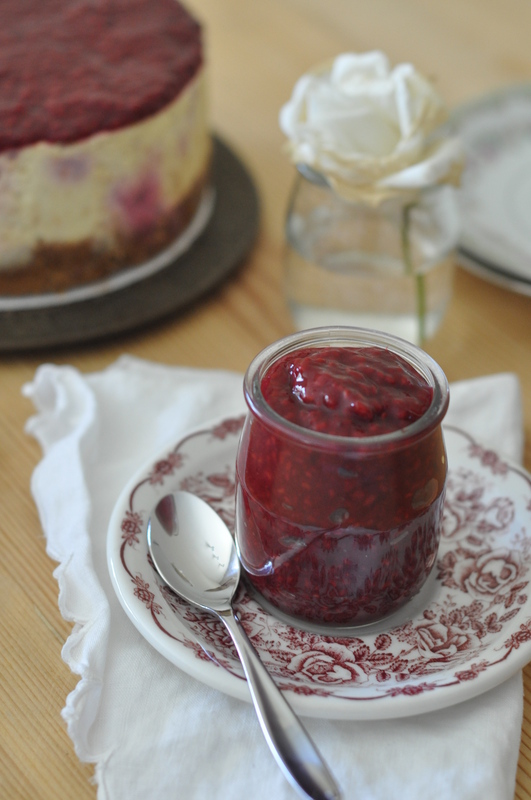 The raspberries can be replaced with any berries. I used frozen raspberries, but if have fresh berries on hand, feel free to use them. I baked the cheesecakes at a low temperature of 265F for a little over an hour and there were no cracks at the surface. I did not use a water bath and I also used regular cake pans and not the Springform pans. However you bake them, just remember to let the cheesecake chill completely before serving. Hope everyone had a great Mother’s Day weekend! 1. In a food processor, combine crackers, sugar, vanilla and cinnamon. Pulse until finely crumbly. 2. Add melted butter and mix until mixture comes together. 4. Divide crumbs evenly between pans and press crumbs into the bottom of the pans. 5. Bake at 350F for 10 minutes. 1. Combine Neufchatel, sugar, and zest in a mixer bowl. Mix until combined. Scrape bottom of the bowl as needed. 2. Add eggs and yolks. Continue to mix. 3. Add vanilla extract and sour cream. 4. Gently mix in raspberries to the mixture. 5. Divide filling between prepared pans. 6. Bake at 265F, about an hour. (Set your timer to 40 minutes and check every 10-15 minutes thereafter. Cheesecake is done when it is firmly set. Remove from the oven and allow to cool completely. 7. Once cooled, refrigerate overnight and unmold the next day. Y= this was more than enough to spread on top of two cheesecakes. I ended up with about 1/4C leftover that I will use for another project. 1. In a saucepan, combine raspberries, water and zest. 2. Allow mixture to come to a boil. Reduce heat to medium and simmer for about 15 minutes. Stir continuously so the bottom does not burn. 3. In a separate bowl, combine cornstarch with a bit of water. Mix until a slurry forms. Pour into raspberries and stir to combine. Allow mixture to come to a slight boil. This will help thicken the compote. 4. Transfer compote to a bowl to allow to cool. 5. 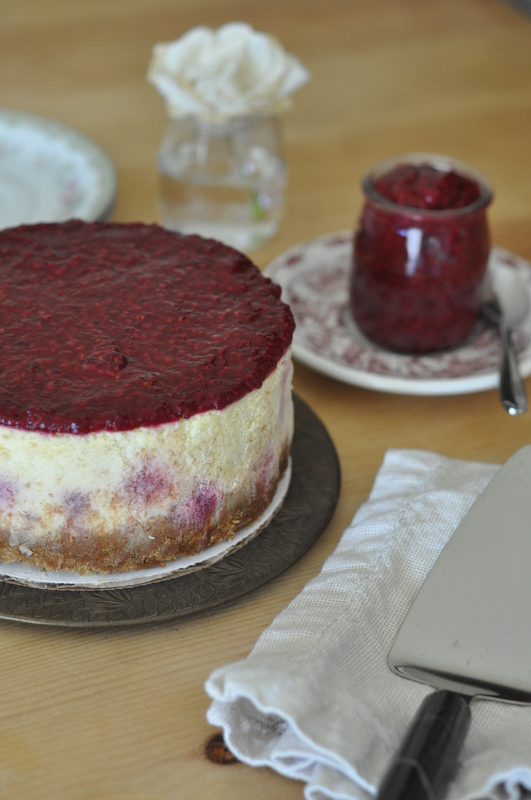 Spread desired amount on top of unmolded, chilled cheesecake.